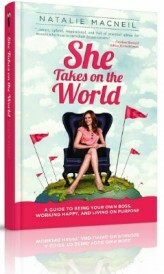 But as far as co-founding Imaginarius, the digital media company which won an Emmy award for producing “Out My Window,” the world’s first 360-degree interactive documentary (like a web-based choose-your-own-adventure film) or authoring “She Takes On the World,” her popular blog and best-selling book about women and entrepreneurship, there was one moment that started it all. LearnVest is the leading personal finance site for women. Our free Money Center will help you create a budget. Our free bootcamps will help you take control of your money, cut your costs or get out of debt. And our premium financial plans — managed by LearnVest Certified Financial Planners — can help you chart a course for the future you want. Posted November 25th, 2012 & filed under Money.